Dr. English is an Asst. Professor in the Dept. of Medicine (Critical Care) and at the School of Epidemiology and Public Health at uOttawa and an Associate Scientist at The Ottawa Hospital Research Institute. Following Internal Medicine Residency training at the Universities of Calgary and Ottawa, he completed fellowships in General Internal Medicine and Adult Critical Care. With a particular interest in the neuro-critically ill, Dr. English pursued a fellowship in NeuroCritical Care at Cambridge University Hospital Addenbrooke’s (UK) and completed an M.Sc (Epidemiology) at uOttawa. 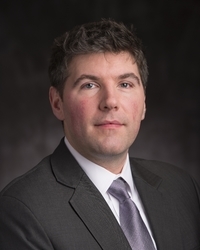 His research interests lie within Neurocritical Care, particularly in subarachnoid hemorrhage (SAH) and traumatic brain injury, with specific focuses on disease epidemiology and secondary neurologic injury prevention in SAH patients. His current research program includes defining optimal blood transfusion triggers in SAH to enhance clinically relevant patient-centred outcomes. His work is supported with funding from CIHR, CBS and the Ministry of Health Innovation Awards.